Over the Christmas and New Year holidays, I tried to do some decent cooking because in Hong Kong, the kitchens are small and mine is not very well stocked with ingredients let alone cooking equipment. I managed to try a brownie recipe from Jamie Oliver's Christmas Cookbook. It called for dark chocolate, white chocolate, sour cherries and I added nuts in there. It turned out a bit gooier than I expected, but it wasn't too sweet thanks to the sour cherries. For our New Year's Eve party, my visiting nephew told us he would contribute to the potluck by making egg tarts and we were surprised and skeptical. Could he really make them? He said he had made it before and found a recipe online. Some of the finished egg tarts that tasted really good! On the day I watched him make it, carefully mashing the butter with a fork, then mixing it with flour, letting it set in the fridge, and then making the egg custard. When the dough was ready, my niece and I helped him shape the dough into each of the holes of the cupcake pan which was a tedious process, before pouring the egg custard in and then baking it in the oven. In the end it turned out quite well! 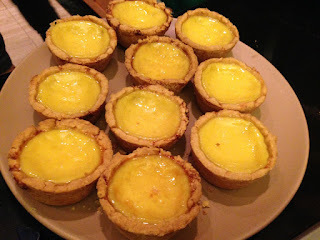 One of my uncles who doesn't normally eat sweet things had one and a half egg tarts before dinner. The crust was a bit tough, but it was strong enough to hold the egg custard, which was actually quite delicious. 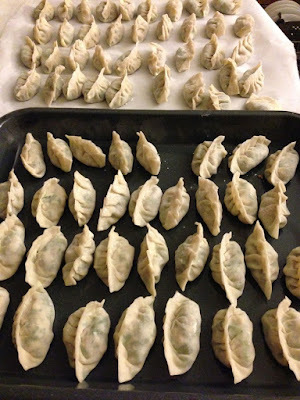 On New Year's Day, we planned to make dumplings. We had some minced pork but not enough meat, so my mom came up with the idea of adding leftover turkey meat that she shredded by hand. Added to the meat was minced garlic, chopped spinach, mushrooms, some oil, sesame oil, Chinese wine and salt. My mom and I started wrapping them, and then my niece and nephew came back from shopping and they started helping out too, the first time for them to wrap dumplings. They learned pretty quickly and soon we were all done, with a few wrappers left over. And the dumplings tasted so good -- they tasted even better thanks to the roasted turkey meat, and with a hint of ginger was very tasty! So if you ever wondered what to do with leftover turkey -- make turkey dumplings! And always use the carcass to either make a broth or congee. Your stomach will love you for it!